JEANNE MARTINET is the author of eight books, including THE ART OF MINGLING, which has sold 150,000 copies and has been published in ten countries. She has been featured in such publications as The New York Times, Salon, The Boston Globe, Glamour and The Washington Post. 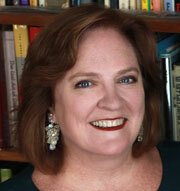 She has shared her humor and mingling know-how on numerous TV and radio shows, including “The Today Show,” “The CBS Early Show,” and NPR’s “Morning Edition.” She lives, writes and mingles in New York City. Does the idea of going to a large party make your mouth go dry? Are you more comfortable on Facebook than face-to-face? You’re not alone: Ninety percent of the world suffers from minglephobia. Jeanne Martinet has developed a cure—a sure-fire system for overcoming fears and having a great time at any type of business or social gathering. 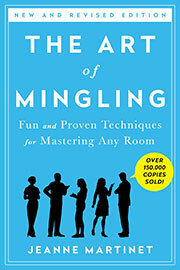 Filled with simple techniques, tricks, tips, lines and maneuvers, and illustrated with entertaining examples, THE ART OF MINGLING teaches you everything from how to approach people to how to follow up with them after the party.